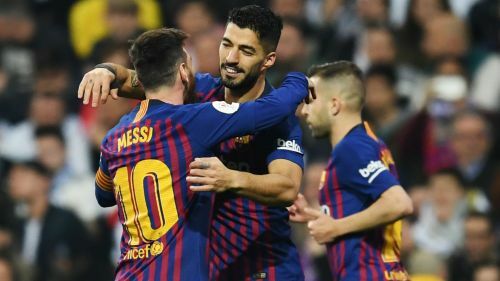 Barcelona boss Ernesto Valverde says there are few players who could match the scoring record of Luis Suarez against Real Madrid, after he inspired his side to a Clasico victory. The Copa del Rey holders reached a record sixth consecutive final after a 3-0 win at the Santiago Bernabeu gave them a 4-1 aggregate triumph. Suarez scored twice in the second half and was claiming a hat-trick, having been challenging Raphael Varane at the moment he turned the ball into his own net. The Uruguay star was similarly ruthless in their last LaLiga meeting, netting three times in a 5-1 win at Camp Nou in October that spelled the end for Julen Lopetegui's time in charge of Madrid. Indeed, Suarez has scored 11 times against Madrid in all competitions, more than he has against any other team while playing for Barca. And Valverde, who seems happy to credit Suarez with Barca's disputed second goal on Wednesday, thinks the 32-year-old has a record against Madrid that any player would be proud of. "I don't think there are many players capable of scoring three times against Madrid twice in the same season," he said, as quoted by AS. Barca's 3-0 win came despite them managing only two registered shots on target and four overall, while Madrid had 14. Valverde was delighted with the clinical nature of their performance, given the comparative dominance of their Champions League last-16 first leg against Lyon, which ended goalless. "Oddly, in Lyon, we had 25 shots with this same team, we didn't score and there was talk of a crisis!" he said. "We had two different halves [against Madrid]. In the first, they were better, and we weren't doing well because they pressed us in certain areas and our pace was very slow. We couldn't get to their goal. "In the second half, we played with more determination. What changed was the intention, mostly. We had no attacking intent in the first half, they pressed us a lot and we were missing a position from which to go further forward, despite the risk. In the second half, we did that."